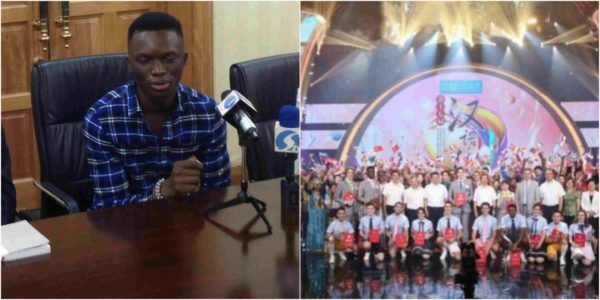 21-year old Nigerian student, Anthony Ekwensi who came fourth in the final competition in the recent contest of Chinese language competition in Beijing, China has given insights on how he beats 118 African countries fellow contestants to come first in Africa and emerged fourth position in the world. The final year student of Nnamdi Azikiwe University in the department of Educational Management and Policy, while speaking to the pressmen in Abuja during a press conference, said he we was not deterred by his friends discouragement . He said despite other contestants who are well experienced in the language more than him he was still optimistic that he will scale through. “I am 21 years old from Nnamdi Azikiwe University. And am studying educational management and policy . Am in final year now. I started learning Chinese language two years ago and back then a lot of people were telling me what is the use of learning the language but I was not discouraged. I saw something new and i just say let me try it out. Then it was always almost free when the language was not expensive . I just say let me just give it a trial. And everyday I just practice and the teachers there were just friendly . You can go to their office talk to them and communicate to them like that . Everyday I keep on getting better . After some time I heard about Chinese competition and I talked to myself what will be the use of the competition to me . So I browse and apply to the competition which is on Chinese language and culture. So, I thought this will be a good one because Chinese people are very curious and so many a times when I meet Chinese people they will ask me about our culture especially how to greet . I later got the chance to represent Nigeria after my registration. When I got there I was a little bit discouraged because most of contestants have lived in China for long. Some of them have even studied there for a very long time . I was like am the only one that did the study in two years . So, this made me to work hard and at the end of the day by God’s grace I was able to win the first in Africa and at the final competition in the whole world I was able to get fourth position. ” So, if I look back with everything I don’t think it was my efforts, it was by the grace of God . So, I thank him for the victory he granted me . Because most of them are experienced than I am . I just thank God I made it,” he said. Also, speaking the Vice-Chancellor Nnamdi Azikiwe University, Prof. Joseph Ahaneku thanked the embassy for their support adding that he was elated by the history made by his student in that contest. “We are here in the Embassy of China to appreciate the level of support given to us . We have had this Chinese studies for 10 years . We started in 2008 and we have grown over the years . We have established diploma Programme , certificate course, HSK and now degree program . “So we’re indeed elated that one of our student is a student under a B.A program participated in a world competition in which one hundred and eighteen participated . All these nations where the Chinese language is being taught and the foreign candidates were all assembled in Beijing and at the end of the day , a Nigerian from the Anambra State , a student at Nnamdi Azikiwe University running a B.A program emerged first in Africa and fourth in the entire world . So, for me and for us this underscores the facts that we are also living up to our expectations in the education sector. “We are also working exceedingly hard to continue to live up to expectations, enlarge our scope in this particular sector, education sector. So, I want to congratulate this young Nigerian youth. He is going to serve as an inspiration unto others so that also learn from his study policies on how to work hard . But I want to say this that since we have been in partnership with this university in China , we have actually given both our resources and time and we have committed quite a number of programs to this particular partnership. And as we speak we have about two hundred Nigerians that have access to scholarships for different programs in China. So, we have had these opportunities that are rare and they are available and on daily basis we keep harnessing some of these opportunities. So, what we are doing at Nnamdi Azikiwe University we are trying to spread our teaching points to various regions and geo political zones in this country . Currently, we have established teaching points now at Ebonyi state , we have at Federal Polytechnic Okoh . We have at Enugu state . We are going to go to Kano and then we also going to establish at Portharcourt . So, what we want to do is to give more access to Nigerian youths so that they can discover bad rediscover themselves. “These are the talents that we have in Nigeria and then when they have these opportunities they can interact with their colleagues in China,” he said.